Eli, born on 4 April 1850, originally came from Oldbury, Worcestershire. He was the third son and fifth child of Thomas and Sarah Bishop. 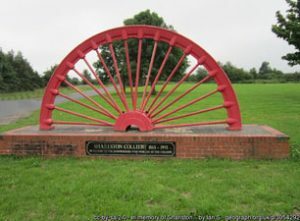 At the age of 11 years, according to the 1861 census, Eli is working as a coal miner, along with his father and older brothers Thomas and Issac in Stavely, Derbyshire. In the 1871 census, Eli and his brother Jesse were lodgers in Aston, Yorkshire – both working as Colliers, a few doors away from their parents. Eli married Mary Ann Bright in 1873, the marriage was registered in Dudley. By the 1881 census, Eli was living at: Sharlston in Yorkshire with his wife, Mary Ann, their son, James, born in 1874, and daughter, Sarah Elizabeth, born 1877. In this census, a niece, Sarah Crompton, born in 1876 in Bedworth Warwickshire – was recorded. I believe that she was the daughter of his brother, Jesse and his wife Nancy Briggs. Also on the census was a lodger called James Briggs (born about 1865) staying with them – this must be Nancy’s younger brother. They were all living next door to Eli’s parents. Jesse and Nancy emigrate to Australia in the late 1880’s with their children and have several more children born in Queensland. Jane born in 1882, Mary born in 1888, Alice in 1891. Their youngest child, Thomas, was born in East Rainton in 1895. By the 1901 census, Eli and Mary are living a few doors away from Catherine Shrigley (formerly Windlow) and her younger sons Joseph and George Windlow. Eli died on 10 February 1929 at 11 Aged Miners Homes, Newtown, Houghton – le – Spring, a retired Coal Miner (Hewer) aged 78 years. He died of Chronic Bronchitis as certified by W Barkes MD. The informant was James Crumpton – Son of 32 Stanley Street, Houghton – le – Spring – registered on 11 February 1929.